GM is boosting online marketing of its certified used vehicles. DETROIT -- General Motors Co. hopes to jump-start sluggish sales of its certified used-vehicle brand with new Internet marketing initiatives that stress consumer value. Paul Pejza, GM Certified manager, said the brand is trying to refocus after the distraction of the company's bankruptcy restructuring. "We haven't been sitting still. We've been paddling awfully hard," Pejza said. "Coming off of last year, with the bankruptcy, we had to refocus ourselves, get our dealers refocused. "Between now and July, we have numerous things that we are launching." In April, sales of GM Certified used vehicles dropped 23 percent from a year earlier to 22,789. In the first four months, sales skidded 28 percent to 87,786. GM Certified encompasses Buick, Chevrolet, GMC, Saturn, Pontiac and Oldsmobile. Saturn had a separate certified program until this year. The industry sold 144,098 certified units in April, up 8 percent. Sales in the first four months fell 4 percent to 513,315. 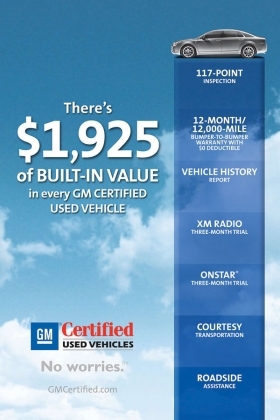 GM Certified kicked off its "Built in Value" campaign in April. It compares the products and services that come with the purchase of a GM Certified vehicle -- such as a 12-month/12,000-mile bumper-to-bumper warranty and trial subscriptions to XM Radio and the OnStar telematics service -- to what's offered by a similar used make and model that is not a GM Certified vehicle. The ad on GM Certified's Web site reads, "There's $1,925 of Built-in Value in every GM Certified Used Vehicle." This month, GM Certified began offering dealers the chance to showcase inventory on GMCertified.com and other sites using video streaming. Dealers who provide at least six photos of a vehicle can create a walk-around experience for online customers. GM Certified also features video testimonials from satisfied customers on its site and on third-party sites, including AutoTrader.com and Cars.com. Pejza said he is "very optimistic" about GM Certified's sales this year but said it is hard to predict because he has no idea how many dealers the company will have. Of the 2,000 dealerships GM earmarked for closure as part of its bankruptcy reorganization, 1,160 applied for arbitration. GM has offered to reinstate 666 of the dealerships in arbitration.